Good news! 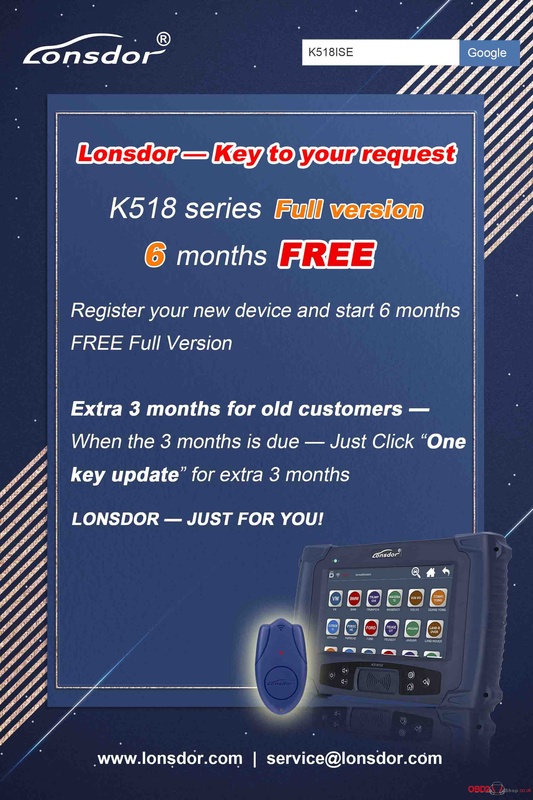 Lonsdor K518ISE prolong free update to 180days for the subscribed menus. Question: How to judge you are an old customer or new customer? Answer: If you already clicked on “Trail Apply”, the machine will judge you are an old customer, when the trial period is up to three months, just click on “One key update” to extend free update for 90 days (for subscripted menus). If you are a new user, you boot the machine and register, then the free update for the subscripted menus are 180 days. As known, Lonsdor K518ISE is tested ok on thousands of car models on October, 2018, many car models are free, and only a part is charged because Lonsdor takes a lot of manpower, money and material resources. Free download Lonsdor K518ISE update on October 2018. A. 365 days is a period and the price is 516.39GBP per period. One year period starts from the day of the trial period finished. D. Subscribed menus beyond one year period require extra payment. Can Visfed Revolation clear DPF and SCR on American Volvo?